How to better fit in a custom size garment? We do custom size for make-to-order items, with a *custom size fee and **plus size fee . 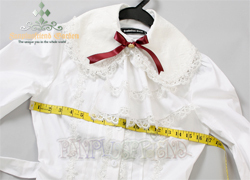 For most items, you may also chose "custom size" to let us make you an custom size one. Please fill in the tag during checkout, or sent us your requirement with order invoice No. after payment. *plus size fee: We charge extra fee for plus size (waist is over 100cm/39inches), based on the fabrics and patterns, the plus size fee is from USD 30-60 per item, (this additional fee is for additional material cost, and the additional shipping cost totally). Please notice, body size is not garment size, so you need give us your true body size (do not give us your garment size, do not edit your body size). We would tailor your clothes according to your true body size and transfer them into garment size by different design standard. For example: we would make your garment with enough spaces for comfortable wearing, or cut some data for design reason (such as for corset waist, or snugy item shoulder, or stretchy item bust, etc.). If lady body size bust, bp bust is 33in, the garment size would be larger than 32in, for a close fit blouse but none stretchy one, the garment bust size is 1-1.5 in larger than bp bust, for loose blouse, it's 2 in bigger, for a light close body coat, it's 2.5in larger, for a winter coat, it's 4.7 in bigger. Same situation as difference size of waist, shoulder width or hip, there are different standard according to design details. All size you given to us, is supposed to net body size, not garment size. All measurements should be given as instruction. (please click the linkages below to see instruction). * optional data, giving them if you have special need here, unless these parts would be made as standard data. Please do not loose the tapeline, all is Net size. Let a friend or relative help you, when you only wear a close clothes. If you have not a tapeline on hand, may use a rope and tell us the lengths. Please give us measurements in unit you familiar, no need to conversion. Thanks again.